The C-R.E.S.A. Steel Tensioner Arm is highly elastic and has a great ability to absorb shocks, knocks, vibrations and oscillations. This is produced by four rubber cushions hidden inside the unit. The tensioner arm can reach an angle of 30° in either a clockwise or an anti-clockwise rotation. The tensioner can be fitted with a variety of different accessories including Sprockets or Polyethylene Slide Blocks to suit British standard simple, duplex and triplex chain, and Rollers in steel or plastic. C-R.E.S.A. is manufactured in steel and has a maximum operating temperature of +80°C. There are two different types of rollers that are available to suit the C-R.E.S.A., steel and plastic (polyamide). The steel rollers are zinc plated for longer life and are fitted with a greased bearing. The steel rollers can be used in temperatures up to +100°C while the plastic rollers may only be used up to +70°C. Sprockets to suit the C-R.E.S.A. 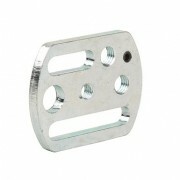 are manufactured in steel and are zinc plated. They are available to suit British standard simple, duplex and triplex chains. The assembly is supplied with the bearing and bolt set to suit your requirements. They can be used at speeds up to 60m/min and temperatures up to +100°C. The slide blocks to suit the C-R.E.S.A. are available for use with British standard simple, duplex and triplex chains. The Polyethylene Slide Block is normally used in slower speed applications and has an operating speed range up to 20m/min and a maximum working temperature of +70°C. These tensioners are interchangeable with industry standards. The CIAO Plastic Tensioner Arm is highly elastic and has a great ability to absorb shocks, knocks, vibrations and oscillations. This is produced by four rubber cushions hidden inside the unit. The tensioner arm can reach an angle of 30° in either a clockwise or an anti-clockwise rotation. The tensioner can be fitted with a variety of different accessories including British standard simple Sprockets made of stainless steel or plastic, Polyethylene Slide Blocks to suit simple, duplex and triplex chain and Rollers in stainless steel and plastic with cover shields, to be used in conjunction with belting. The CIAO is manufactured in plastic with stainless steel bolts, and has a maximum operating temperature of +80°C. There are two different types of rollers that are available to suit the CIAO, stainless steel and plastic (polyamide). Both rollers are suitable for use in the food industry or in other applications where environmental issues require high grade materials. The rollers are fitted with greased bearings with cover shields . The stainless steel rollers can be used in temperatures up to +100°C while the plastic rollers may only be used up to +70°C. Sprockets to suit the CIAO are available in plastic and stainless steel to suit British standard simple chains. Assemblies are supplied with a bearing and stainless steel bolt set. These assemblies can be used at speeds up to 60m/min and temperatures up to +100°C. The slide blocks to suit the CIAO are available for use with British standard simple, duplex and triplex chains. The Polyethylene Slide Block is normally used in slower speed applications and has an operating speed range up to 20m/min and a maximum working temperature of +70°C. The CIAO slide blocks are used with stainless steel bolts. 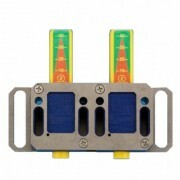 The BLU Tensioner is manufactured in plastic and uses stainless steel screws. 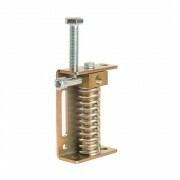 The internal spring is available in zinc plated steel or stainless steel. Maximum operating temperature is +80°C. All bodies are supplied with a preloading system to allow you to bolt the unit in to position and then release the tension. The tensioner can be fitted with a variety of different accessories including Sprockets or Polyethylene Slide Blocks to suit British Standard simple and duplex chain, and Rollers in zinc plated steel and plastic to be used in conjunction with belting. The stroke of the BLU is 40mm. The BLU Tensioner Roller Kit consists of a steel fork with centrally located roller . 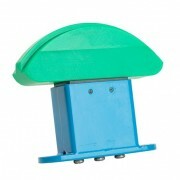 The rollers are available in plastic (polyamide) or in zinc plated steel, and are fitted with a greased bearing. Maximum operating temperature for both roller sets is +80°C. The BLU Tensioner Sprocket consists of an aluminium fork with a centrally located sprocket to suit British Standard simple or duplex chain. The sprocket is zinc plated steel installed on an enlarged bearing, and is equipped with a stainless steel screw. Maximum operating speed is 60m/min. Maximum operating temperature of the sprocket is +80°C. 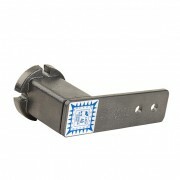 The BLU Tensioner Slide Block consists of a polyethylene sliding block and a stainless screw. It is available for British Standard simple, duplex and triplex chains. 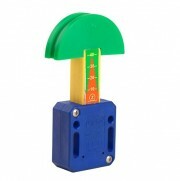 The ‘U’ style slide block can be used for chain up to 15mm wide. Maximum operating temperature of the sliding block is +70°C, and is suitable for use in the outside environment. 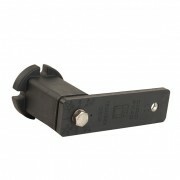 The BLUD Plastic Tensioner is available in three different styles. The standard allows for compact installation in tight applications, the Extended Bracket Type as ideal for narrow installations, and the L-Shaped Bracket Type is completely versatile allowing for 3 different mounting positions. The BLUD is manufactured in plastic and uses stainless steel screws with the bracket also manufactured in stainless steel. 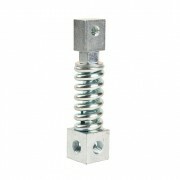 The internal spring is available in zinc plated steel or stainless steel. Maximum operating temperature is +80°C. All bodies are supplied with a preloading system to allow the unit to be bolted into position and then release the tension. The tensioner can be fitted with a variety of different accessories including Polyethylene Slide Blocks to suit British Standard simple, duplex and triplex chain, and Rollers in zinc plated steel and plastic. The stroke length of the BLUD is 40mm. The TEN JOY Tensioner is ideal for applications which are very tight for room. It can be used in conjunction with Sprockets or Polyethylene Slide Blocks to suit British Standard simple, duplex and triplex chain, and Rollers in both zinc plated steel and plastic. The ARCO Tensioner is very slim, making it ideal for very narrow applications. With many different ways of fitting the ARCO, the installation applications are endless. It can move 40 degrees in both directions and be used in conjunction with Sprockets and Polyethylene Slide Blocks to suit British Standard simple, duplex and triplex chain, and Rollers in both zinc plated steel and plastic. 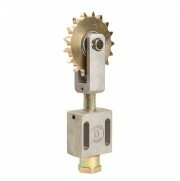 The TEN BLOC Tensioners has a self aligning head that can swing through 360 degrees to align with the chain or belt. It has an aluminium body and steel nickel plated column. It is capable of higher torques than other similar type tensioners. It comes pre-assembled with a Sprocket or Polyethylene Slide Block to suit British Standard simple, duplex or triplex chain. Naismith Engineering is proud to announce the release of the new Easy Ten chain tensioner. This tensioner has been developed to handle the heavy duty requirements of industry today. It uses the latest in high grade Polyethylene to give you the longest life possible. The unit is also fully interchangeable with the Span Box size 1 & 2. A wide range of Polyethylene Slide blocks are available in 3 different styles. 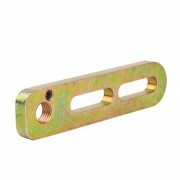 They are also available to suit a large range of chains from 04B to 24B in Simplex, Duplex and Triplex. The ASSO Tensioner is ideal for taking up tension on chain or belting where no shock absorption is required. A basic zinc plated steel arm, it can be used in conjunction with Sprockets and Polyethylene Slide Blocks to suit British Standard simple and duplex chain, and Rollers in both zinc plated steel and plastic. The MIX Tensioner is available in two sizes but it can be used in many ways making it a very versatile manual tensioner. There are varying accessories available that can be used including Sprockets and Polyethylene Slide Blocks to suit British Standard simple and duplex chain, and Rollers in both zinc plated steel and plastic.